Expert sports-betting tips for football and more. Concise match analysis and a weekly tipster competition with great prizes! 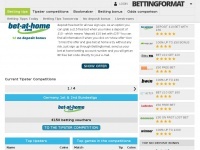 BETTINGFORMAT is specified as the websites creator.